Followup to the last post on sampling for fabric for a bag …. weaving is underway. Probably not colours that I would have chosen, but I’m quite chuffed with the result (though my leather sewing skills and rubbish – the leather trim needs a lot more practice. 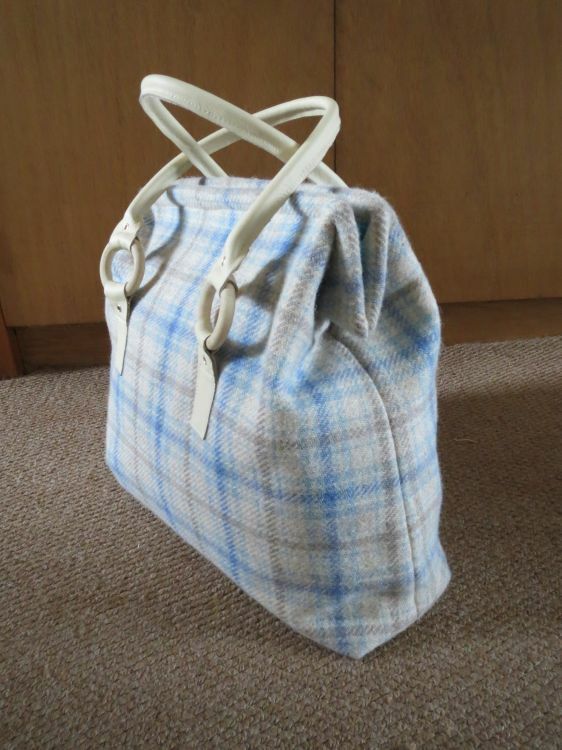 I’ve also made a couple of small bags and its amazing how little fabric you need for that. So now I’m ready to go with the main project. The weave is chosen (an 8-shaft undulating twill) and I’ve warped enough in the heathery shade for 2 bags. Half will be woven with the grey and the other with the dark red. Here’s the heather warp (195 Moorland) with the grey weft (103 Sholmit) from Jamiesons of Shetland. This entry was posted in Whats going on! and tagged Bag, handweaving, Jamiesons, Shetland, twill. Bookmark the permalink.